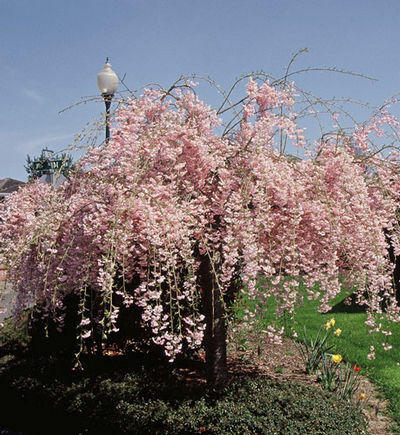 Graceful arching branches cascade toward the ground on this medium sized flowering cherry. Beautiful double rose pink bloom in early spring followed by copper colored foliage that matures to green in summer followed by yellow to orange in the fall. 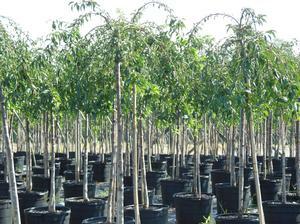 We offer the Double Subhirtella 1" to 1 1/2", 6' tall in a 20 gallon container. In 1912 The Mayor of Japan donated over 3,000 cherry trees to our nations capital in an effort to continue the close relationship between the two nations. In March 1912 1st Lady Helen Taft and the Vice-Countess of Japan planted two cherries to commemorate the occasion. From that simple ceremony, each spring The National Cherry Blossom Festival is held. People from all over the world come to enjoy the splender when the trees are in bloom.